Raissa M. Hill, DO is a board-certified family medicine doctor with 20 years of experience. As the founder of HT Family Physicians, a leading family medicine practice with locations in the cities of Stockton and Lodi, California, Dr. Hill provides a complete menu of primary care services to patients from the greater San Joaquin area. Dr. Hill believes that listening — both to what patients say and what they don’t say — is an integral part of providing first-rate, personalized care. “Learning about patients, their lives, and offering advice, both clinical and personal, is what doctoring is for me,” she says. Born in New York City and raised in Stockton, California, Dr. Hill obtained her undergraduate degree at the University of California at San Diego. 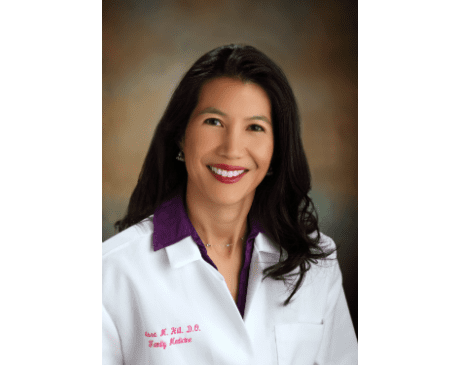 Following a short stint as a molecular biologist with the Veteran’s Administration, she received her medical degree from the College of Osteopathic Medicine of the Pacific-Western University of Health Sciences in Pomona, California. Dr. Hill went on to complete both her internship and her residency training at the University of California Davis San Joaquin General Hospital in Stockton, where she served as chief resident. After finishing her residency in 2000, she founded the family medicine practice that has since become HT Family Physicians. Dr. Hill is on the editorial advisory board for the Therapeutic Research Center in Stockton, and is a past president of the San Joaquin Medical Society. For her ongoing contribution to family medicine, the UC Davis Department of Family and Community Medicine selected Dr. Hill as its 2012 alumni of the year. She is affiliated with Dameron Hospital and St. Joseph’s Medical Center of Stockton. Dr. Hill loves to travel with her husband and two children; she’s also an avid cook, enjoys jazzercise, and is fluent in Spanish.